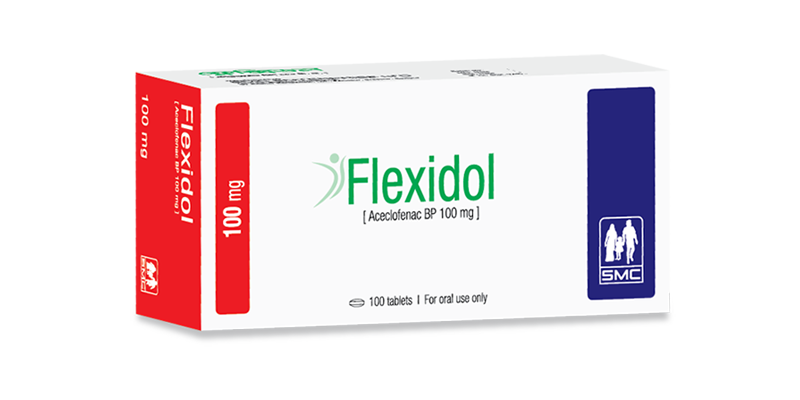 Flexidol tablet: Each film-coated tablet contains Aceclofenac BP 100 mg.
Flexidol (Aceclofenac) is a non-steroidal anti-inflammatory agent. This drug exhibits anti-inflammatory, analgesic and antipyretic activity. Flexidol is an inhibitor of prostaglandin synthesis. For the relief of pain and inflammation in osteoarthritis, rheumatoid arthritis and ankylosing spondylitis. Adults: The recommended dose is 100 mg, twice daily. Children: There are no clinical data on the use of Aceclofenac in children. Aceclofenac is generally well tolerated, but occasionally patient may complain gastric discomfort, nausea & dizziness. In exceptional cases, very sensitive patients may suffer from gastro-intestinal bleeding, skin rashes and thrombocytopenia. Use of Aceclofenac should be avoided in patients with gastro-intestinal disorders and gastro-duodenal ulcer. In case of severe hepatic or renal damage or disturbance of cardiac function, a close medical surveillance is indicated. Blood counts including platelet counts, as well as monitoring of hepatic and renal functions are recommended, particularly in patients under long-term therapy. Pregnancy: This drug should be avoided in pregnancy. Lactation: Aceclofenac should be avoided during lactation period. This preparation is contraindicated in patients with known hypersensitivity to Aceclofenac or any other components of this preparation. This preparation should not be given to patients who have experienced asthma, urticaria.